Cain's musical passport to classic rock obscurity, then posterity, was stamped by their first album, A Pound of Flesh, which would be roundly ignored by the world beyond the upper Midwest at the time of its release -- only to resurface nearly 30 years later on CD, transforming the band into collectors' darlings. Recorded in 1975, A Pound of Flesh reflected a half-decade's worth of hard graft for the band, and a wide gamut of influences that simultaneously intrigued and confused listeners lucky enough to secure one of the original vinyl copies. On the other hand, one could say there was something here for everyone. For one thing, Cain's lengthy experience playing blue collar clubs peppered all the way from the Twin Cities to Chicago made it second nature for them to wheel out handfuls of no-fuss, heavy blues workouts like "Heed the Call," "South Side Queen," and "If the Right One Don't Get You (The Left One Will)" -- all of which stood in sharp contrast to their occasional flights into rarefied art rock, via the anthemic but ponderously bloated signature ballad "Katy," the eight-minute "All My Life" (a convergence of Deep Purple's "Highway Star" with any number of mid-'70s Rush efforts), and the slow-strutting "Badside," earmarked by multi-tracked choired vocals reminiscent of Queen and the rising Styx (with whom Cain shared many a stage). In fact, Cain singer Jiggs Lee possessed the same knowing sneer in his gravelly voice as Styx's James Young, although he was also capable of intoning a caramel-sweet croon so as not to scare away the little girls in the audience. Back to the songs at hand, however, perhaps the only unqualified winner by most any definition was rampaging opener "Queen of the Night," which coalesced both the intellectual highs and visceral lows of the band's creative aspirations, before wrapping them into a perfectly balanced package of power, class, and hooks. Needless to say, though, a single world-beater does not a hard rock classic make; and although it would be extremely convenient to blame all of Cain's woes on their hapless record label, ASI, the honest truth is that A Pound of Flesh was a very solid but not spectacular album, worthy of appreciation but not immortality. 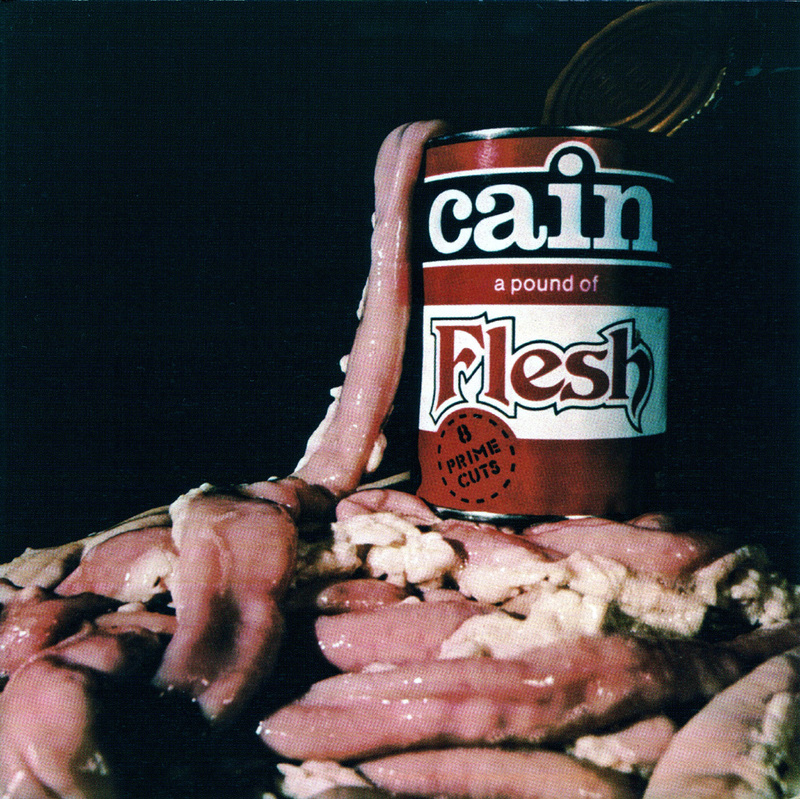 In this reissue of A Pound of Flesh featured three additional demo tracks from 1978 that were originally intended for Cain's third album, prior to the band's breakup. 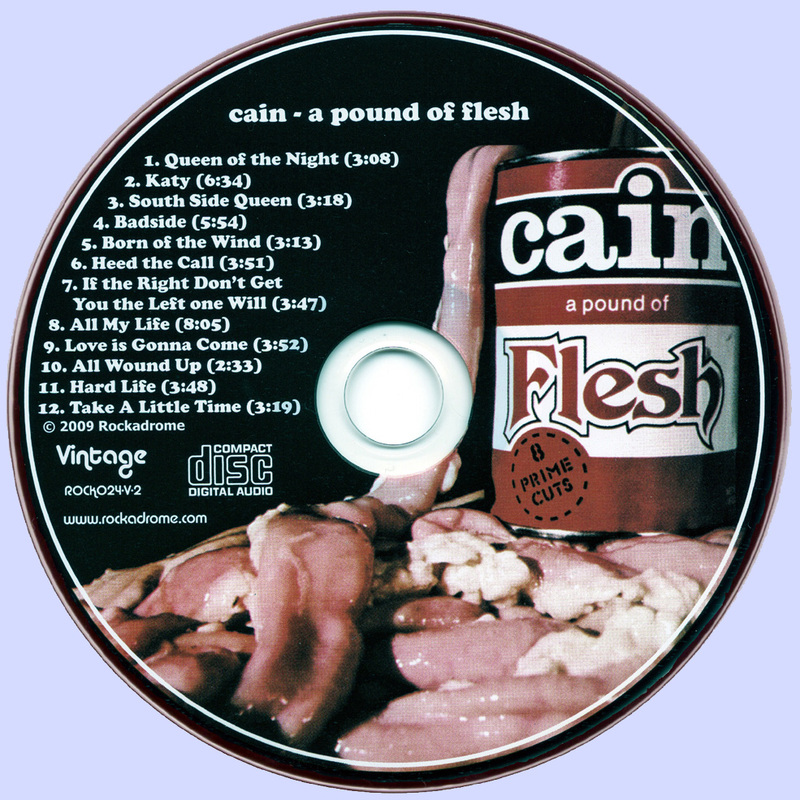 All three suggested that Cain were moving steadily away from their hard rock bread and butter, especially with the rather forced funk-rocker "All Wound Up," and the AOR-coiffed single, "Take a Little Time." Just by listening to the video, this band sounds amazing! I just saw that Nelson had his handiwork done with the ripping and scans of this album.